Once a conference is over, I always have good intentions on keeping all that wonderful information tucked away in a Google folder. Time passes and then I'm wondering what was that great idea from Tuesday morning at METC? This year I went down the session grid and searchable program to toss URL links into a padlet. Some types of links work better than others. Google Slides URL's work the best. The slide pictures that appear on padlet are a little stretched out but you can recognize what the session is about. Once you open up the presentation, you can view it just fine in View Only. Websites are problematic, especially weebly sites. They link but images do not show up so I grabbed an image shot and then the url link in the description. Joquette Johnson's LiveBinders showed up just fine since Padlet took the icon image for her binders and used those as the images. Hint to all presenters: please take time to add your resources at least by the end of the conferences. Now I have my list to review the sessions I attended and new ones that I missed. 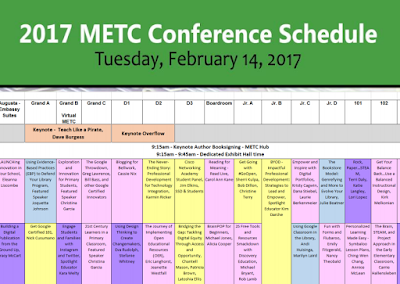 Click here for the direct link to METC 2017 padlet.